At the time, I was working with three products – the HRT Music Streamer II, the iStreamer, and the HeadStreamer. The first two devices are designed to work with a desktop stereo system, while the HeadStreamer is a pocket-sized portable unit. Simple design, with an input that is USB for the HeadStreamer, it could convert just about any digital file and bit-rate you might use. In USB device mode, it supported up to 24-bit @ 96kHz content using Audio Class 1.0 native drivers via an asynchronous data transfer protocol. If the specifications seem similar to the microStreamer, you aren’t dreaming – some of the specs are indeed almost identical. However, the design and capabilities are not just new but also improved. The design is still pure minimalist Bauhaus; nothing superfluous. Construction consists of a high-quality aluminum case, with one USB port, two output mini-headphone jacks and a set of tiny LEDs that indicate what sampling rate it is working with. That’s it. No buttons, adjustments, switches, options, or EQ choices - just plug and play. There is a small combination DAC and headphone amp in the same package but with a mini-jack for headphones and line-level out. 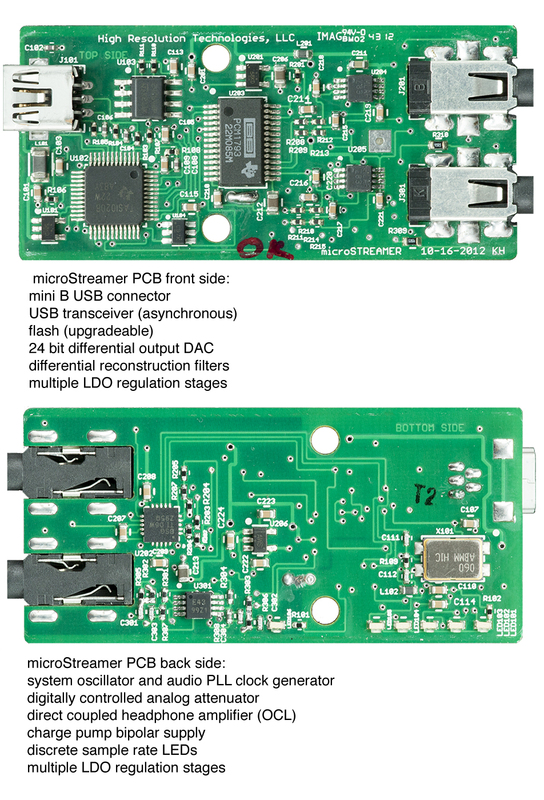 The microStreamer is small, light, and portable. For those readers familiar with the HeadStreamer, all sounded familiar until the mention of the case material and additional line-level output jacks. Yes, the microStreamer adds an additional jack to feed to a pre-amplifier, a set of powered speakers, or receiver. This blurs the line between their Streamer series and the portable systems. The new design is just a little larger then a camera battery, a solid rectangular block of metal with tiny recessed holes backlit by the LEDs which indicate sampling rate, or if “Mute” is active. The “micro” label is appropriate; the unit seems a third smaller then its predecessor, although I rather missed the softer edges of the HeadStreamer. While there is a bit of subtle rounding to the edges, my concern was that, since I tested on the road with my MacBook Pro, the new design might accidently scratch my screen. I found myself being extra careful when I used it, and wished I could get a silicon rubber skin for it. But that is a minor concern, as the jacks appeared to be high-quality, and the LEDs worked as expected, far more consistently then the display on the Fii0 Alpen we tested last year in which the display almost never matched the sampling rate and bit-depth of the original files. In talking with Robert Robinson of Channel-D software, creators of the highly regarded Pure Music application, it seemed that one possible reason for Fii0’s problems were due to the non-asynchronous design, which predicated a different relationship between the unit and the software feeding it. By comparison the HeadStreamer and microStreamer were both solid in indicating the proper sampling rate, although they don’t display the bit-depth, so one assumes they are processing the files at their bit-depth. Maybe this is due to the use of asynchronous data transfer protocol for the USB connection, either way, having asynchronous USB simplifies matters as there isn’t any special settings required using either Pure Music or Decibel which I also used to test high-resolution recordings, just plug and play. How did it sound? In a word, great. Of course I said the same thing about the HeadStreamer, and as one might expect, the microStreamer was a significant improvement on the audio output of either our Macs’ or PCs’ onboard audio. I used the word “great” to describe their sound quality, a word that has virtually no measureable objectivity (special thanks to Wittgenstein for that reminder) but which does describe the overall experience. While the difference in design, technology, and assumed impact on sound quality can certainly be measured, and the design and components can be precisely defined, but that isn’t our goal or approach. I was primarily interested in the difference between the new microStreamer and the HeadStreamer. Aside from the industrial design differences, the audio quality seemed very similar from my notes. I had hoped to compare the two units side-by-side, but it wasn’t possible, so I’m relying on my notes and memory of the older unit. One difference I thought I detected was the ability to more easily drive larger headphones, and with the venerable Audio Technica ART ATH-A900X closed-ear design headphones I found it difficult to drive into clipping, and while there was a bit of strain with deep bass content played at high-volumes, in normal use the unit appeared to drive a wide-range of earphones and headphones effortlessly. As it turns out the output amplifier design is identical to the HeadStreamer so, in theory, there should be no difference as far as that’s concerned. However, since there are many other differences in the signal path before the output amp, it might just be that my observations were correct, just not for the reason I thought they should be. I did have a few technical issues with the units when I used them with Decibel – on occasion, the sound suddenly stopped. The fix was simple: unplug the USB cable and reattach, and all was well. In talking with Kevin Halverson of HRT, his suggestion was to restart the Mac, which would flush the cache, and in that instance, it worked fine. I also talked with Stephen Booth, author of Decibel, to better understand the issue, and from all appearances it seemed a software issue, rather than a hardware issue. HRT sent another one out to me, and appeared to reduce the issues considerably. In the process of trying to sort out this issue, as well as the Fii0 reporting errors, I discovered that part of the problem might lie in the way in which files were being prepared. For example, a series of tracks from Society of Sound’s The Planets, by Holst, simply had no information on the recording appearing in Decibel, while other tracks worked perfectly. In looking at the tracks carefully it appeared that they were indeed problematic, and after I reported the findings to SOS, they wrote back to thank me for the information, but there was no additional follow-up, so hopefully they have revisited the encoding. The HRT line is based upon asynchronous USB, an elegant implementation of the USB protocol that allows for more accurate data transfer, and although once rare at this price point, it is becoming commonplace. The general rule is that jitter is bad, and asynchronous USB can reduce jitter. There is a lot more to the overall sound then a specific technology. The minimalist, no-fuss, no-muss aesthetic in HRT’s design was consistent in the audio footprint. When using iTunes to play Apple-supplied and home-ripped files in MP3, AAC, or ALC formats, one could easily pick out the HRT microStreamer. But the real musicality was revealed when we switched to Decibel or Pure Music as our players, and switched to Apple Lossless, FLAC, and AIFF files with no compression. For source music we listened to pristine high-bit audio files from the B&W Society of Sound website, which features Peter Gabriel’s curated choices of music from around the world, most of which was available in three formats (24-bit FLAC, 16-bit FLAC, and 16-bit Apple Lossless). We also listened to high-bit music from HD Tracks and Chesky Records. One HD Track title that showed off its recent remastering was from Crosby, Stills, and Nash. Their debut album featured tracks like Wooden Ships, Suite Judy Blue Eyes, and Marrakesh Express. I compared them to two previous CD releases, and the audio was exemplary; one could almost feel the air in the studio between the guitar amps and the listener. The microStreamer allowed every nuance of those tracks to shine, not with a gloss, but with a warmth and naturalness I came to expect. Listening to an older release from HD Tracks, Sea Changes from Beck, the delicacy of the recording almost made the heartache palpable, and comparing the Beck and CSN recording on the superb new Oppo BDP-105 Universal Audiophile 3D Blu-ray Player with its top-of-the-line Sabre DACs and integrated headphone amp, the quality of the microStreamer was evident. This unit is indeed a bargain for the price. While the Oppo is different beast, and certainly nothing you would want to toss in your backpack for a long journey, comparing the two units using headphones and earphones was educational and revealed just how good both units were. Overall, the HRT microSteamer just stayed out of the way offering more dynamics, cleaner headroom, and an airy nature that produced a rich and complex soundstage. The microStreamer is a bit quieter then it’s predecessor according to the company, but since the HeadStreamer was already very quiet, any improvement to the Signal/ Noise ratio and floor is pretty subtle. I believe that, where the HeadStreamer picked up a bit of grit with more demanding headphones, the microStreamer seemed a bit less ruffled when I tried it again with the Audio Technical ATH-W1000X. I checked with Kevin Halvorsen, the CTO for HRT, and he confirmed that the differences between the two units were more than skin-deep. He wrote that “the microStreamer is in general, a higher performance product than the HeadStreamer Mobile; the specific areas which differ are the power supply and the analog stages (reconstruction filters and line drivers). The sections which are similar are the USB transceiver and the DAC Si itself, from that point on, the two use different topologies and different components.” My hunch that the amplifier was different was un-founded, it was the same amp as before, so much for memory versus reality. In my testing the audio experience seemed a refinement of the previous products from HRT, with a nicely balanced, dynamically believable soundstage. The ability to drive both your earphones or headphones, as well as offer line-level output, is unseen at this price point. With serious competition in this product segment from others including the DragonFly and the new Meridian unit, the microStreamer’s only drawback is the 96khz sampling rate limitation, but the line-level output, small footprint, and reasonable price place it in a niche all its own. Because I travel and often work at my desk with my laptop, the HRT microStreamer became a favorite and constant companion. Small, unobtrusive, tough, and easy to use, it comes highly recommended. We enthusiastically recommend the HRT microStreamer combination headphone amp/external DAC for great sound on the go, or in the home.